Occupy Boston demonstrators are not going away. Saturday they marched through downtown Boston starting at Park Street. The march began as a rally organized by Veterans for Peace. Hundreds of protestors made stops at the Armed Services Center, the Hyatt hotel, Verizon and a Bank of America building. 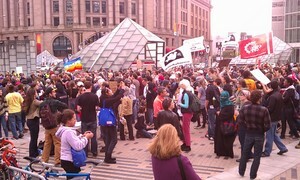 This Monday and Tuesday will feature concerts at Dewey Square where demonstrators have set up camp since October 30, 2011.